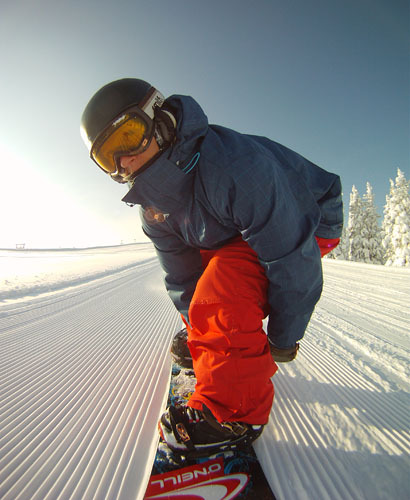 Testing a GoPro camera on my new try-pod mount on the nose of the snowboard. Well, the construction is stable. Finally after welding 12 single pieces of iron together and drilling some holes in the board. This is the new look of my board's nose. But the board rides very different now! And you don't won't to fall on the construction. You have to ride carefully with that thing on it. Some pictures turned out pretty cool. It is a pretty unique angle. Wish I could jump with it. the construction looks like a submarine when I am riding deep powder.